If you are looking to outfit your control panel with timers that have an attractive LED display, consider the new PTC-20 series that deliver functionality at competitive prices. Designed for you to best fit the correct timer to your application, the PTC-20 series is divided into three separate models. The PTC-21 base unit offers five field-selectable operating modes and time ranges as well as a host of other convenient features. The high performance PTC-23 model offers advanced functions such as dual setpoints and 1 ms resolution. The PTC-22 repeat cycle model provides a repeat cycle (batch stop, batch continue) and interval modes specifically tailored for cyclical operations. With ultimate simplicity in mind, the PTC-20 series utilizes an intuitive button-per-digit method for setpoint input and easy to follow scroll-thru menus for programming. 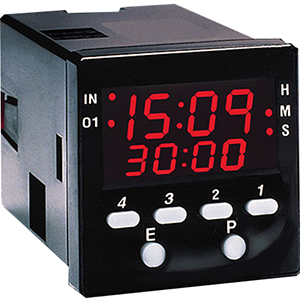 The dual line display optimizes the interface by indicating both the present time value and the setpoint, while up to 8 annunciator lights provide status. Multi-level security enables shop floor access to be custom tailored to your needs. Intended for tough industrial conditions, the PTC-20 Series offer a NEMA-4/IP65 rated front panel and a high degree of noise immunity. Choose from models with a 5 amp relay, which can directly drive a load, or solid state outputs for high speed applications.